What Is A Finish Mower, And Why Would I Want One? A friend recently asked me to help clear out a portion of their newly acquired farm and spruce it up for a garden wedding. Everything was set. Tractors, brush mowers, and even shears. But something was missing. I told them that if they are aiming for a perfectly manicured lawn, they will need a finish mower. Also known as the finishing mower or grooming mower, a finish mower is a grass-cutting tool that is typically attached to a tractor or ATV to give the yard a smooth, close trim. It is ideal for sports fields, public parks, and even your own backyard, as it lets you save time and energy by covering large areas in one go. For everyone else who also wants to know more about finish mowers, I’m going to answer some common questions and hopefully help you decide whether you should get one as well. But first, let’s clear up this confusion. What is the Difference Between a Finish Mower and a Brush Mower? While finish mowers and brush mowers are both used to cut lawns, they are different in function and appearance. Brush mowers are high-powered machines that work great in tearing through tall grass and heavy vegetation. Finish mowers, on the other hand, are best for light cutting to give your lawn a polished look. To put it simply: think of brush mowers as barber scissors and finish mowers as electric razors. One chops off the locks, and the other gives you the buzz-head look. It’s understandable to confuse one for the other if you are new to lawn-mowing. Since we are highlighting the groomer’s best friend here, let’s focus on the finish cutter’s best qualities. What are the Features and Benefits of a Finish Mower? The best advantage is great productivity in lesser time. You just sit on a tractor, maneuver it, and you have acres of fresh, even turf. A typical model with the minimum specifications can shave an area as wide as 5 feet in one pass, with the grass trimmed to as short as an inch. And with a cutting speed that can go to 18,000 feet per minute, you can polish your lawn in a breeze. Do I Need a Finish Mower? It depends! Landscaping experts and lawn-mowing pros could definitely use a finish mower for grooming massive turf grounds. If you are a homeowner with lots of estate ground to maintain, then the finishing blades would also be ideal for you. How big is my lawn? – If it’s smaller than half an acre and you don’t mind a bit of cardio, consider getting a push mower instead. Is my lawn flat and obstacle-free? – If your yard has been cleared off tall growths and is ready for an even shave, then it’s time for some finishing touch. Do I want a perfectly manicured lawn? – Who doesn’t, right? You will need a finish mower to keep the grass short or at a consistent length throughout. What Kind of Finish Mower Should I Get? For homeowners, a model with 60 to 99 inches of cutting width will do. Professional trimming jobs for large commercial areas would require more heavy-duty equipment. Consider getting the 150- to 250-inch kind and pair it with a high-powered tractor. Aside from cutting width, you should also consider the number of blades. Do you want a coarse or fine finish? The more blade the mower has, the finer the cut. In summary, the right finish mower for you also depends on the type of mowing job you want and the size of your property. 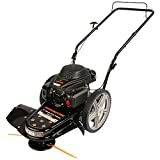 What Accessories Would Work Best with My Finish Mower? Most modern finish mowers already come with safety shields. The hood keeps foreign objects out while the blades are at work, giving you peace of mind when there are pets or people around (though everyone should still steer clear when you’re mowing, of course!). Others have built-in baffles or mulching kit. This is optional, so you can get a separate discharge bag where grass clippings will go. Attaching the kit would re-cut the grass into tinier pieces, making them decompose faster when distributed evenly. Mulching also helps make your soil healthier. Big models with super wide heads often have retractable “wings.” This feature lifts the side mowing heads for easy storage or transport through narrow paths. If you want your lawn to have a smooth, contoured look, then the finish mower is right for you. This grass-cutting machine works best for vast areas, making them ideal for contractors, lawn care professionals, and property developers. Homeowners with a big backyard could use this too! But of course, you should first consider things like the size of your lawn and the grooming output you’re aiming for in order to select the best finish mower to do the job. My friend was able to achieve the perfect green carpet for the garden wedding I talked about earlier. It was a clean backdrop to the intricate colors and patterns they used to decorate the place. Picture-perfect for a beautiful occasion! It was even more stunning if you see the before and after photos placed side-by-side. Once a pebbly patch of farmland riddled with weeds transformed into a beautiful, patted lawn. Looked like something out of a royal palace if you ask me. What we used was a 72-inch finish mower that’s compatible with my buddy’s ATV. The model has a tapered side and rounded front, plus a rear discharge deck. Mowing with good maneuverability reduced the trim time, especially with the alloy steel blades that cut the grass with utmost precision. I would also recommend this design (a combination of pre-installed baffles, deep deck, and rear discharge) to anyone because it lives up to the promise of giving you premium results. Clearing the area didn’t take half a day with that setup. I’m pretty sure they will maintain that patch for future recreational activities like barbecues or a ball game. And I bet they will look forward to using that powerful equipment and get a high-quality cut with a snap of a finger.